Just FYI, since I was unable to announce this at the January meeting, I’m doing it here! I will be bringing a plastic tote to begin collecting for “Nana’s Second Thoughts” at the February meeting. If you have been setting aside items for Nana’s, now is the time to clear that space and let me store it for you. If you have fabric to donate, sooner is better for my committee. It will allow us more time to prepare and package it for resale. Kay Beach and Alice Allinson appeared on KTVO’s Good Morning Heartland program with Ela Soroka to talk about our upcoming Quilt Show and to show our raffle quilt. The gals did a great job and represented our organization well. Thanks Kay and Alice! In case you weren’t up at 6:15 a.m. when the show aired, here’s the link to the KTVO site. 2015 Hands of Friendship Quilt Show is Coming! 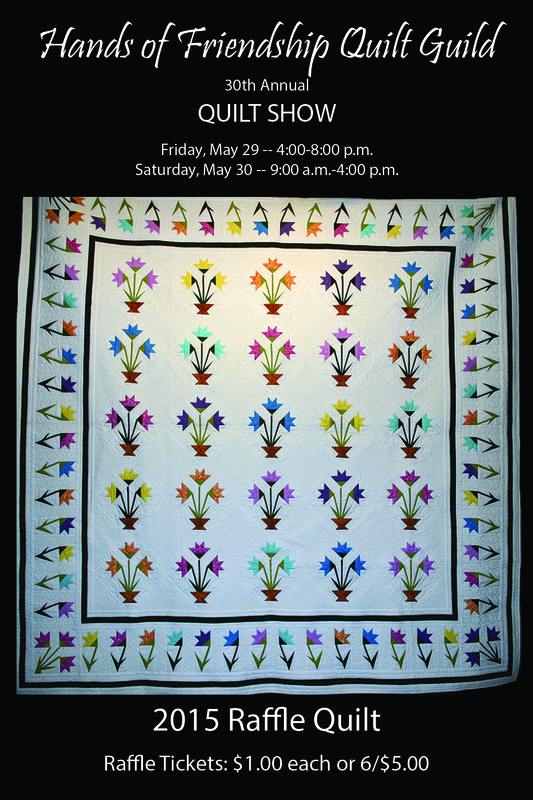 The Hands of Friendship Quilt Guild’s 30th annual quilt show will be held May 29 and 30th at the YMCA in Kirksville, Missouri. Not only will there be over 110 beautiful quilts, we’ll have hand-quilting and machine-piecing demonstrations, Bed-Turnings, the Community Service display, our gorgeous raffle quilt, and vendors! Raffle quilt tickets are available from any guild member or at the quilt show. Entrance to the show is a $2.00 donation. Click Raffle Quilt Flier 2015 for a downloadable pdf of the flier. 2015 Quilt Show Entry Form — Deadline extended to May 8. The deadline has been extended to MAY 8, for the entries for the 2015 Quilt Show. The countdown has begun! The 2015 Hands of Friendship Quilt Guild’s annual quilt show will be held May 29 and 30th at the YMCA in Kirksville, Missouri. Tickets are $1.00 each or 6/$5.00 and are available from any guild member or at the quilt show. Entrance to the show is a $2.00 donation. Click Raffle Quilt Flier 2015 for a downloadable pdf of the flyer.